LocalSignal is specifically created for small businesses with local customers. LocalSignal provides the tools to bring in new business, without breaking the bank and without a steep learning curve. The Nexus displays all of the accounts you have access to in a list. After you login to LocalSignal App, the Nexus will be the first thing you see. It lists all of your current accounts. Click on an account name to edit/ view the account. Create a new account to start a new project. You can access the Account Nexus anytime by using the menu under your profile picture in the top right of the website. 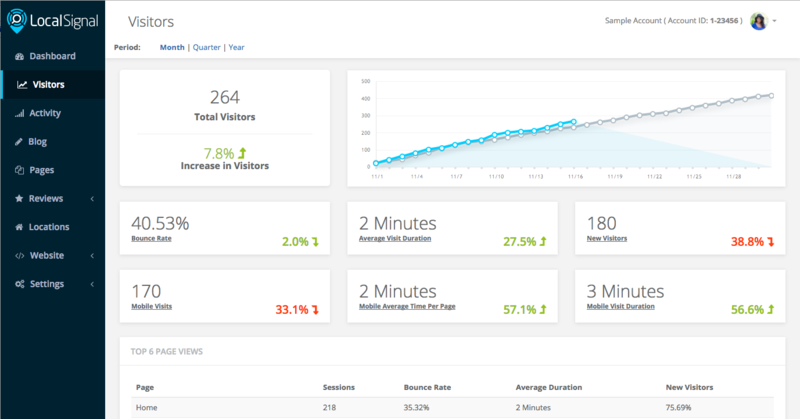 The LocalSignal Dashboard gives a preview of your monthly website activity. There is not enough data to compare results. Google Analytics is not connected to LocalSignal. 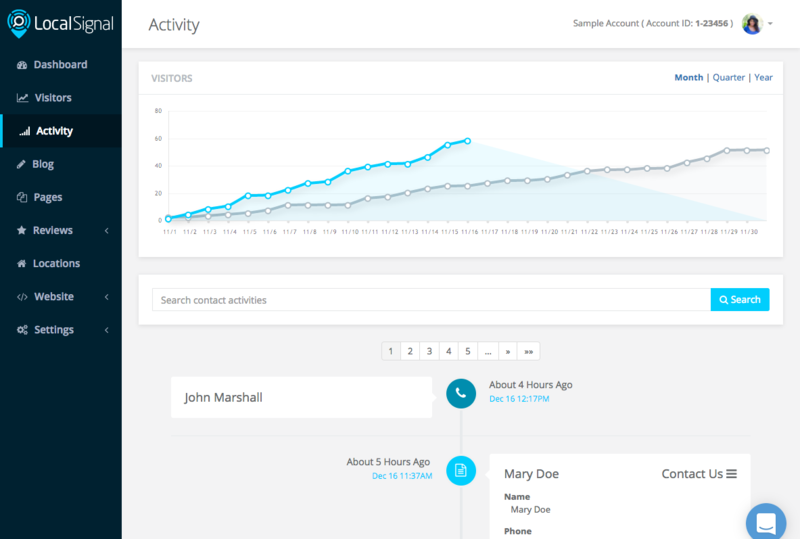 This area shows detailed visitor activity for your account’s website. Activities are collected through a number of sources and compiled in the Activity timeline. Click to expand the activity cards to view more information or write notes. Manage your blog through the blog section of LocalSignal. Blog data is stored at a web capsule level. Once the Blog is created, the index page and Blog Posts Template will be automatically added to the Pages area in LocalSignal. Accounts can have multiple blogs. Each blog has a corresponding Index Page and Posts Template Page. Pages displays your active web capsule's content. Each website comes with the following pages which cannot be deleted: Home, Page Not Found (404), and Maintenance Mode. Additional pages may be added, removed, and rearranged. You can select pages to view or edit content. Note: This area will be blank if there are no web capsules in the account. Create a new website capsule to get started. 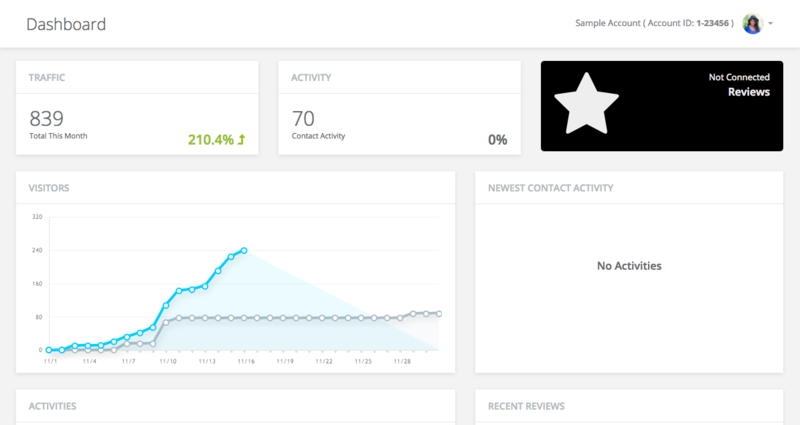 LocalSignal tracks your company's reviews and shows them in one area. There are two sections View Reviews or Request Reviews. LocalSignal collects reviews from services such as Google, Facebook, and Yelp. Locations provide a way to manage your listings on LocalSignal. The information listed will automatically connect across social media platforms.